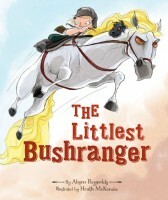 I’m thrilled to share that the fabulous Heath McKenzie and my latest book, The Littlest Bushranger, is being released on June 1! Later in June, there will be a blog tour with prizes. Excellent prizes. I’m still working out the exact dates, but look for it mid June. And look for the book in your bookshop! In the meantime, here’s the cover and the blurb. CONGRATULATIONS, Alison, on this gorgeous new book baby. It’s a fabulous story, beautifully rendered and produced. Can’t wait to read it to you know who!